Confused About What To Pack? No need to be! I have packing list guides for all seasons that will help you decide what to take. Below are some basic guidelines to help you get into the 'zone', since packing for a long journey like the Camino de Santiago takes some skill and hardly any of us ever get it right the first time around (I certainly didn't!). Once you have read the info below, press on the link of your choice and get packing! Good luck and Buen Camino! 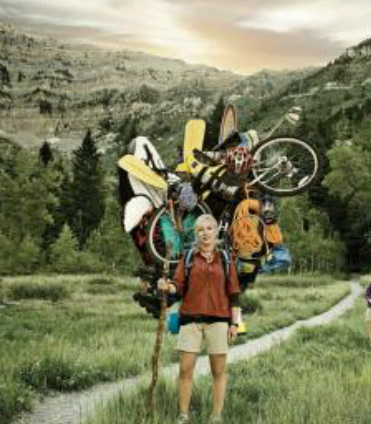 10 per cent of your body weight is the rule of thumb when it comes to the question of how much you should carry in your backpack. This is not a precise art, and whether you can carry a little more or need to pack less very much depends on your body strength and stamina. What everyone who has walked the camino will tell you for sure is that after three or four days of walking,and especially if you have crossed the Pyrenees or a mountain range similar to it, you are likely to reassess the contents of your pack and dump anything that you don't need. By the time they reach cities like Pamplona, many pilgrims (I was one of them!) find that they either donate a lot of their clothes and unnecessary accessories, or they find a post office and send them back to their country of origin. As much as we may prepare physically for the camino, there is nothing that matches the reality of walking the roads and steep inclines with more than 7 kilos on our backs. While we may also be prepared for a much simpler lifestyle without our usual fashionable clothes, our appliances and beauty products, it is quite common for pilgrims to imagine that there are certain things that they simply cannot do without. It is with thoughts like these in mind that things get complicated. I felt I simply couldn't do without shampoo and conditioner or moisturizer for my whole body. I certainly wasn't leaving without my make-up and at least two changes of clothing. I ended up with my usual-size bottles of everything and a backpack heavier than I was comfortable with. Other people told me how they needed to take their mini laptops, Ipads and hairdryers and found themselves suffering under unnecessary weight. One young girl struggled up the steep climbs of the Napoleon Route almost collapsing every time she walked a hundred meters. Her alarmingly large backpack was crammed with stuff she 'couldn't do without'. Most of us who'd overdone it ended up donating our clothing and beauty products, and sending some of our electronic equipment home. One lady who had packed 20 kilos of newly-bought, very expensive clothes ended up having to transfer most of her stuff to her two sons' backpacks because it didn't make financial sense either to send the items home or to ditch them. Needless to say, the young men were not too happy with their mother. Leaving on a trip like this, we are filled with deeply-rooted insecurities and these are manifested in the unnecessary items that we take with us. Rather like children needing their comforters when they are in a strange environment, so we grab at the familiar things that give us a sense of safety. It takes the camino to teach us that we can live safely for a while with the barest minimum. Not only do we find ourselves safe and perfectly comfortable doing without our usual 'playthings', but we actually discover a sense of freedom and empowerment in not 'needing' them. We discover the difference between 'wanting' and 'needing', and this has a powerful impact on our lives. Before you pack, it is extremely useful to remember to differentiate between your WANTS and NEEDS. You are likely to find that once you have packed exactly what you need, your target packing weight will be almost reached. Anything else that you take after your needs are fulfilled will be listed in your wants category, and these things you have to consider carefully. Are they expensive? If a time comes that you need to dump stuff, can you afford to donate them? Can you afford to send them home in the post? Would they be safe in the post? When I took extra clothing, I bore these questions in mind, and made sure that I didn't spend too much money on additional items. When I did eventually donate them, I didn't worry about what I'd spent. As for other things, I WANTED to be in touch with my family (I didn't NEED to be), and I WANTED to take photos to remind me of my experience. I only took a small phone that would take a Spanish simcard and a mini Ipad that served as my guidebook (I bookmarked lots of necessary camino pages). The Ipad also had a great camera, so I was happy to carry it and leave my Nikon behind. After four days of physical pain and emotional drama on the journey, I got rid of my large bottles of toiletries and replaced them with miniature sizes and so I could accommodate the things that I WANTED to continue carrying. Like so many other pilgrims, most of my packing wisdom came with hindsight, so THINK before you pack! SO! Here We Go...Your Packing Guides for All Seasons!